Leicester City’s first taste of Premier League football came, and ended, in the 1994/95 season, when they were relegated at the first time of asking. When Mark McGhee left the club unexpectedly in December 1995, the Foxes hired Martin O’Neill – a young, enthusiastic manager who had guided Wycombe Wanderers to two consecutive promotions. Under O’Neill, Leicester returned to the Premier League, and after signing the likes of Muzzy Izzett, Steve Claridge and Matt Elliott to bolster their ranks, finished 9th in their first season back in top-flight football, as well as winning the 1997 League Cup. Leicester spent a further six seasons in the Premier League, either side of another relegation in 2002. Since 2004, they’ve played in the Championship, and even had a season in League One. Forgetting their recent troubles, this is their classic XI. The 24-year-old French stopper arrived in England in 1997 when he signed for Leicester on a free transfer. In seven years playing in his home country, Arphexad had made just five first team appearances – for Lille and Lens – and was immediately placed behind Tim Flowers in the Filbert Street pecking order. However, after just under 30 appearances for the Foxes in three seasons, his match-winning performance against Arsenal in the 2000 FA Cup lead Liverpool to offer him a contract at the end of that season. Arphexad went on to win six medals during his time at Anfield, all without setting foot on the pitch. Added to the Worthington Cup winners medal he picked up with Leicester in 2000, despite once again being an unused substitute in the final, Arphexad’s bulging trophy cabinet makes him one of English football’s luckiest players. He left Liverpool in 2003, had spells at Stockport, Coventry and Notts County, and retired with Marseille in 2005. Swedish international full back Kamark spent four years at Filbert Street in the 1990s, signing in 1995 after appearing in Sweden’s World Cup campaign a year earlier, in which they exceeded expectations to finish third in the tournament. 65 appearances and four years later, he said goodbye to Leicester to sign for AIK. In the run-up to Euro 2000, Kamark starred for Sweden in a friendly against Scandinavian rivals Denmark. In a challenge with AC Milan defender Thomas Helveg, he suffered a knee injury which ruled him out for the rest of the year, and the impending championships. In press conferences after the incident, it wasn’t unusual for Kamark to break down crying to express his grief. He now works as a pundit for Swedish TV channel, TV4. 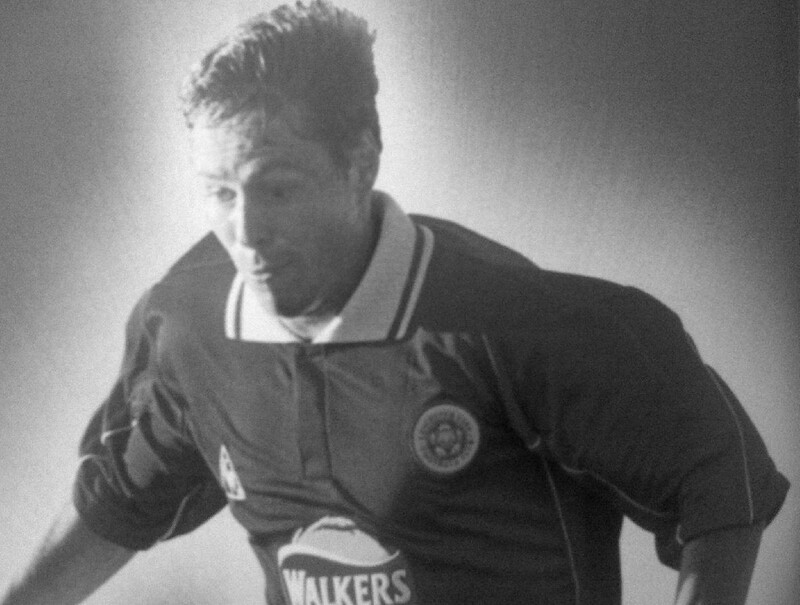 Leicester paid Scottish side Ayr United £100,000 for French centre half Rolling in 1995. After the Foxes’ promotion to the Premier League in 1996, though, he found it increasingly difficult to break into the first team, and after just 24 first team appearances, he dropped down the divisions to sign for Bournemouth in 1997. His 15 minutes of fame on the south coast came in an Auto Windscreens Shield semi-final, in which he scored twice to book the Cherries’ place in the final. His heroics bizarrely weren’t enough to warrant an appearance in the final, though – a decision which ignited a breakdown of relationships between Rolling and the Bournemouth management. He retired in 2001 after spells in Austria, Greece and France. A towering, no-nonsense rock at the heart of the defence, Prior made his name with home-town club Southend United, before arriving at Leicester in 1996 via a spell at Norwich. In two years at Filbert Street, the £600,000 signing was almost ever-present, missing just 12 Premier League games, as well as picking up a League Cup winners medal in his first season. Spells at Derby, Manchester City and Cardiff followed his time with the Foxes, before he ended his career in England with a three-year spell with boyhood club Southend. Upon his retirement in 2007, Prior and his family moved to Australia, where he began a sportswear business called Love Football, as well as briefly turning out for Newcastle Jets in 2008. He is now assistant head coach of the Australian women’s football team. A consummate professional if ever there was one, Whitlow signed for Leicester in 1992 for £250,000 from Leeds, and went on to make over 170 appearances for the Foxes in five years. Like Spencer Prior and Pontus Kamark, he was also part of the club’s successful League Cup run of 1997, and his steady, reliable performances earned him a £500,000 transfer to Bolton in 1997, where he spent six years. Stints at Sheffield United and Notts County rounded off Whitlow’s career in 2007, when he retired, aged 39. His attitude and professionalism whilst playing meant a move into coaching was inevitable, and he has held youth development roles at Derby, Mansfield and at his current club, Burton Albion. Spending the majority of his career at the Foxes and Queens Park Rangers, Impey was a versatile, speedy player who could slot in at full back or on either wing. During his seven year stint at QPR, Impey became the first player in the club’s history to win the Player of the Year award three years on the spin. After just over a year at West Ham, Impey arrived at Filbert Street for a fee of £1.6million. After making over 150 appearances for Leicester in just under six years, Impey called time on his Foxes career, signing for Nottingham Forest, where he had previously had a successful loan spell. His career ended in 2006, meaning he has plenty of spare time to tweet. Nalis was rapidly forging a reputation as a journeyman in his native France after appearing for five clubs in seven years at the beginning of his career. He eventually settled at Bastia, before moving to Italy with Chievo in 2002. The defensive midfielder played only eight times for the UEFA Cup qualifiers and failed to impress. Leicester boss Mickey Adams took Nalis off Chievo’s hands on a free transfer in 2003, with the aim of the Frenchman becoming a vital cog in the newly promoted Premier League side. He played 59 times in two seasons but couldn’t stop Leicester being relegated at the first time of asking in 2004. Nalis went on to play for Sheffield United, Plymouth, Swindon and Coventry but is now retired. During his stint at Leicester, Zagorakis was widely considered as no more than a steady and competent midfielder involved intermittently in the first eleven. Signed from PAOK Salonika for £750,000, he made only 34 league starts in just over two seasons, showing only intermittent flashes of brilliance in an unspectacular side. Zagorakis though will be remembered for his performances with the national team. Four years after leaving Leicester, he captained an unfancied Greece side to glory in Euro 2004, with Zagorakis himself picking up the Player of the Tournament award. In all, he made 120 appearances for the national team before hanging up his boots in 2007, by which time he was back with PAOK. Lawrence’s big break in the professional game was unorthodox to say the least. He was involved in crime in his youth and was spotted by Isle of Wight-based club Cowes Sports who signed him to their squad. In turn, Howard Wilkinson, the then-Sunderland boss was impressed with Lawrence’s form for them and took him north in 1993. It wasn’t until 1995 and Lawrence’s arrival in Leicestershire that his career began to settle. He made 47 league appearances in two and a half seasons at Filbert Street before leaving for Bradford City for £50,000. He played his best football at the Bantams and became known for his multi-coloured hairstyle, spending six years at Valley Parade before ending his professional career with the likes of Brentford and Grimsby. He is currently player-manager at non-league Ashford Town. Guppy’s beginnings in the game were humble, as he combined his vocation of building with turning out for Conference club Wycombe Wanderers. Upon Wycombe’s promotion to the Football League though, he began to attract the attention of clubs much higher up the league pyramid. He moved to Newcastle for £150,000 in 1994 but made just one appearance – as a substitute in the League Cup. After a successful spell at Port Vale, his boss at Wycombe, Martin O’Neill, took Guppy to his new club Leicester for £850,000. He played 170 times for Leicester over four seasons, winning the League Cup in the process. After winning the Scottish Premier League with Celtic, Guppy attempted to forge a career in Major League Soccer, but injury curtailed his spell with D.C. United. He hung up his boots in 2008 after a spell with the Rochester Rhinos. He remains the only player to have represented England at semi-professional, under-21, ‘B’ team and senior level. It all started out so rosy for Trevor Benjamin. 46 goals in 146 games for Cambridge United prompted Peter Taylor to shell out no less than £1.3million for his services in 2000, as Leicester looked to filled their Emile Heskey-shaped void. Big things were expected from the lumbering, 21-year-old forward from Kettering. Benjamin went on to make 91 appearances – 54 of those from the bench – in five years for the Foxes, scoring just 12 goals and interspersed amongst seven loan spells. His contract was eventually terminated in 2005, and it’s fair to say his career took a turn for the worst. In the next five years, the one-time Jamaican international turned out for no less than 20 different clubs, both league and non-league, which, added to the eight he’d already played for, takes his total to 28. Still only 32, he left his post as Morpeth Town player/manager in May this year.